Thailand is one of our favourite countries to visit, hence why it had to be part of our honeymoon year of travel and the wandering wedding dress. What we love most about it is the kind and gentle nature of the people, the warm climate temperatures and the unique flavours of the food (at very reasonable prices). We have visited Thailand for at least a month each year for the past three years and keep returning to Chiang Mai (northern Thailand) to explore it even further. You can read more about our travels in Thailand and what we recommend seeing, doing, eating and visiting in my travel blog Luxe Life Travel. 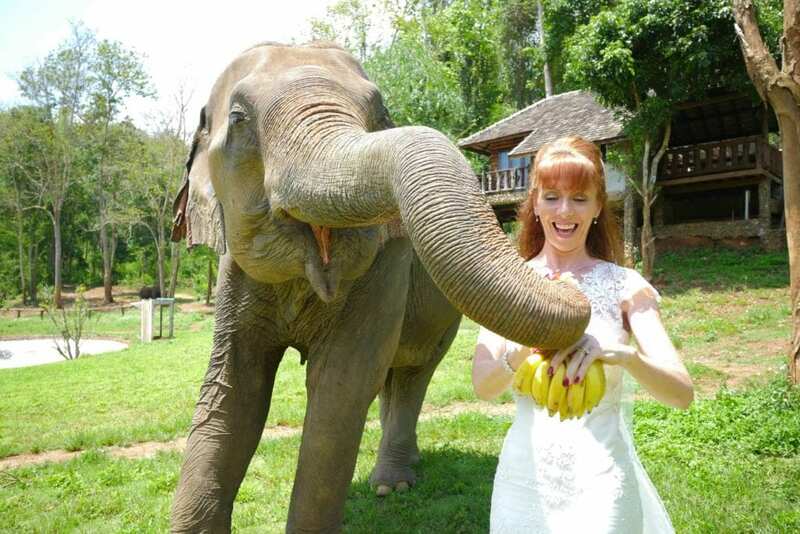 With so many wonderful experiences to be had it was difficult to choose which ones were my favourites and would also honour the wandering wedding dress diary Thailand and our honeymoon experience. Initially, I chose five locations but then when reality set in (with travel, the heat, time, food etc) I ended up narrowing it down to three: An elephant sanctuary, the Buddhist Temple at dawn, and the Sunday night markets in Chiang Mai old town. I woke in the wee hours of the morning (as planned) to discover it was absolutely pouring with rain. In a half-dazed state, I deliberated for about half an hour on whether I should cancel or trust it wouldn’t rain long. I chose the latter and was so glad I did. Having lost half an hour though I had to quickly shower, put my best face on and then “foof” up my hair as best I could. Squeezing into my dress I suddenly realised an oversite. I couldn’t do the buttons up by myself and my husband was still sound asleep. Oh well…I grabbed the vail and then did my best pretzel impersonation trying to get into the car. Once in, I was quite surprised how easy it was to drive with a wedding dress on. Ha! Us girls can do anything right?!. Collecting Sazzu Hope (my Thailand photographer – see info below) on the way we arrived at the Wat Phra That Doi Suthep which is the most famous of the over 300 temples (wats) in Chiang Mai. Standing in the carpark in a wedding dress, it must have been a funny sight as she did up all of my buttons. All part of the adventure. We were at the base of the 309 steps to the temple just as the sun began to peek over the mountains and into the valley that houses Chiang Mai. There was a quiet hum of activity as the locals went about their daily preparation opening their stores ready for the regular sea of tourists. Several of the monks were completing their chores. I would have liked to have been photographed with them but as a woman, that is not allowed. On my last visit, however, I was blessed by one which was an incredible experience. Climbing the stairs was quite a test of my fitness level or lack thereof (especially in a wedding dress!). On the way up we encountered a local dog having his morning walk. He excitedly went to jump up on my dress to say hello. After a brief moment of panic (visions of ripped wedding dress shot through my mind), I scooped his paws up in my hands, patted his head, then he carried on up the stairs. At the top, we first walked around the outside of the temple. Taking in the natural beauty of the flowers in the trees, fog rising up from the valley and the most gorgeous gold-plated doors! Anyone who knows me will know how much I just LOVE doors. I think it’s because of my curiosity about what is behind them. In the grounds surrounding the temple we also took some shots by the temple bells. These are rung at different times during the day and can be heard near and far. Unfortunately, too many tourists tend to ignore the signs from the monks requesting they not ring them which makes for not such a zen experience. There’s also the big gong which symbolises the beginning of prayer time. And another set of doors with a yin and yang dragon out the front. The monks keep the grounds immaculate despite the thousands of tourists every day. Once inside the temple, if you haven’t been blown away by the grounds surrounding then prepare to be wowed by the huge monument that takes up the centre. Called a Chedi it stands 24 metres tall and is completely gold plated. There are several smaller monuments surrounding the main one and different places for you to sit quietly. It is requested you remain quiet so as not to disturb those who are praying and giving thanks. You can purchase candles, incense, bells and various other items for prayer however not being Buddhist I didn’t feel this was appropriate so I just gave a donation instead. Having said that, Buddhism does intrigue me and what little I know of it I like the core values. Something for me to explore further for sure. The time came to go back down the stairs and head to our next location. It was now mid-morning and the sea of tourists were beginning to transcend and make their way up the stairs. I came upon two little girls dressed in traditional dress. I had seen them on previous visits to the temple and I must admit, they break my heart. The oldest (maybe 7yrs old?) is very business savvy and does the negotiating (payment in return for photographs with them) and the youngest (maybe 5yrs old) is then coerced by her sister to pose. What I see if I look a little deeper though is a big sister providing for her family and a little girl who just wants to play. I look forward to the day when I can afford to employ her parents so she doesn’t have to work, pay for them to attend school, and allow them the freedom to play as all children should. For now though, I just give them what I can from my pocket, hug them and add them to my prayers. Our next location was the Chai Lai Orchid elephant sanctuary. 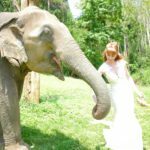 I had been here before and although they do practice reasonably ethical standards of care for the elephants the best elephant experience we have seen was when we were staying in the mountains of Chiang Mai at Karma Royal Bella Vista. But that was over an hour away so Orchid was the next best choice for the wandering wedding dress. 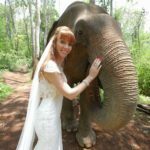 I chose to have a photograph in my wedding dress with an elephant for two reasons. One was because I wanted to see the elephants again. They are so majestic and I feel so calm around them. The second was to raise awareness of the way they are treated and the changes that are occurring in Thailand to protect these incredible animals. Their big brown eyes and gentle yet strong nature are qualities I love in both people and animals, and especially animals with such power. They truly are gentle giants (most of the time). If they aren’t it’s usually down to how they are being treated. Which I am happy to report is a lot better than it used to be and is improving all the time. The Thai people are realising that most westerners these days care about the health and wellbeing of elephants and abuse of any form isn’t going to be tolerated. There are a lot of people who are dedicated to saving elephants from cruelty and giving them a better life and the elephants at Chai Lai Orchid are all rescue elephants. When I was looking for the nearest sanctuary to visit for the photographs I was pleased to find that more and more of them were promoting “no riding”. Just because these creatures are big and strong, doesn’t mean we should ride them. In my earlier travels to Bali in Indonesia, I did ride an elephant and felt guilty the entire time. Her carer seemed lovely and didn’t use anything more than gentle words to coax her to go the direction he wanted her to go but the big wooden chair just looked terribly uncomfortable for her and when they weren’t working they were chained up to a post. 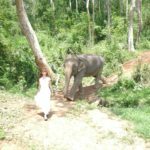 Plus, I hated the thought that she had to work every single day instead of being out in a large paddock running around and playing with other elephants or maybe even bringing up a baby elephant. Last time we were in Chiang Mai we had experienced some incredibly happy elephants that were ridden (by others, not me) but with no chairs. They were allowed to play in the river, travelled as a herd, and were washed (by their paying customers) and just seemed so much healthier and happier than any others I’ve seen. There was even a little baby elephant who stayed close to the side of its mother. This was the experience we had while staying at Karma Royal Bella Vista. It’s a short walk from the resort and it is the best I have seen in Thailand, or anywhere for that matter. The problem is, although they were treated well and had limited working hours per elephant, they still weren’t entirely free. They were still expected to “perform”. After a brief drive from the city we arrived and made our way across the high bridge (an adventure in itself). After a brief wait, we were taken through the huts (you can book to have an elephant experience accommodation here), and up to the back paddock and asked to wait. It wasn’t long before a handler arrived with elephant in tow. I can’t recall the name of our elephant so I am going to call her Hwan because that means sweet in Thai and that’s what I sensed when I looked into her eyes. That she was sweet, wise and kind. There were lots of bananas for us to feed Hwan (it takes a LOT of food to fill a tummy that big!) and she seemed to enjoy our company. She was surprisingly gentle as she took each banana from my hand and seemed very aware of her size. After all the bananas were gone, upon the handlers suggestion we walked with her a little way up the hill which was nice. I think the handler was trying hard to provide us with “special photographs” which was lovely but all I wanted to do was to just be near her. After we walked a little way the handler then tried to get Hwan to kneel down so I could sit on her leg. I tried to explain I didn’t need to but the handler seemed insistent. So, I quickly bent my knees and hovered as gently as I could, took a couple of pics and then stood up so that Hwan could then get up from what looked like a very uncomfortable position for such a large animal to be in. We then followed her back to the huts and on the way, with her handler up ahead she broke off the top of a hose sending water rushing everywhere. She was either just being a mischievous girl or rebellious. Either way, I still wished I could have put her in my pocket and taken her away with me to a big ol' farm where she could roam free all day with her friends. As we walked back to the entrance, we went past other elephants that were chained but it seemed they were only there momentarily until the tourists who had paid to ride them got there. There were also others that were down in the river playing in the water and mud and seemed to be having fun. Overall, I think these elephants are cared for quite well but it still felt like they were having to work and I wondered how often they had to. I felt guilty that I was contributing to that but was also glad that my dollars were at least keeping these elephants safe from a worse situation and fed well. There is still so much more that can be done and as tourists, we have the power to continue to change this situation by the choices we make. Last stop on our wandering wedding dress Thailand photoshoot was the Chiang Mai night markets. This market is world renowned as one of the places to experience when you are in Chiang Mai and one of my favourite things to do and hence why I included it in the wandering wedding dress. The markets are housed within the walls of the ‘old town’ and the easiest way to get there is either by a taxi or a tuk-tuk. Although the taxi would have been cheaper the tuk-tuk is a more traditional means of transport so we went with that. A tuk-tuk is a three-wheeled vehicle with an engine and a roof to protect you from the sunshine (or rain, depending on the season). This means of transport originated from the second World War from the original rickshaw which is a two-wheeled passenger cart pulled by a man (or woman). Getting in and out of the tuk-tuk was a little difficult in the dress but it was a wonderful way to travel through the buzz of the streets and arrive at the markets. Every time I visit these markets I am impressed by the creative abilities of the local people. They are so talented and also display a high sense of ingenuity. Some of the business ideas such as creating miniature plates of food, or dressing up sunglasses, or painting superheroes with a twist, are extremely unique. There’s also the typical food and clothing stalls which are anything but ordinary. You can eat a delicious traditional Thai meal for just a couple of dollars that would rival the best local Thai restaurants back home. As we made our way through the hustle and bustle of the markets it was definitely an unusual experience for me and the stares from onlookers could have made me feel uncomfortable was it not for all the lovely compliments received from passer byes. Some people even wanted to have their photographs with me. It was so sweet. Of course, you can’t go to the markets and not purchase something to support the locals. So, while we were there I chose some true to their word scented candles. There was everything from flowers, to chocolate, and even pizza scent. Plus some lanterns for my awesome photographers' new house she was just moving into. I also came across what we call in Australia “Fairy Floss” and what is known in America as “Cotton Candy” so I had to order some of that, just to watch it being made. Of course, it is entirely sugar and I no longer eat sugar so instead, I gave it to the nearest local child I could find. A young boy who was sitting patiently with his father at their stall. I now have a new friend for life! 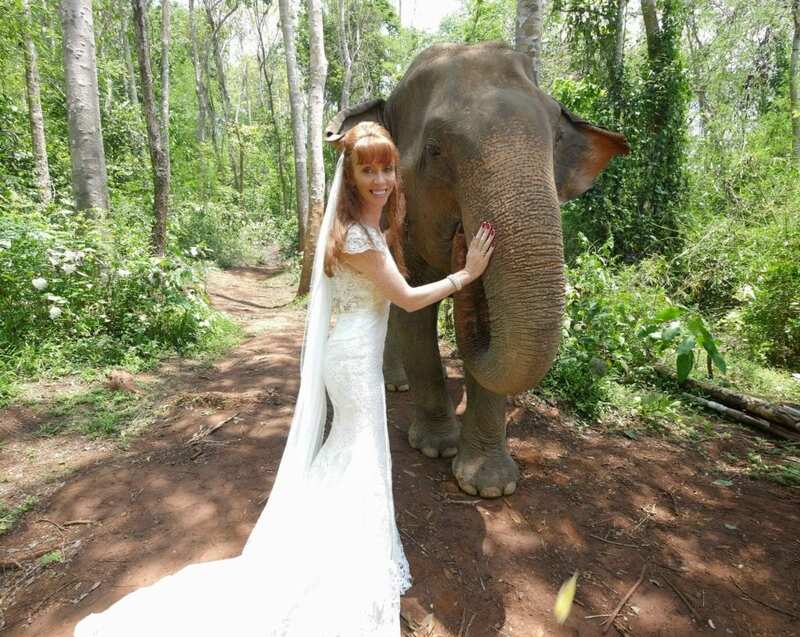 I hope you have enjoyed reading about the wandering wedding dress diary Thailand. 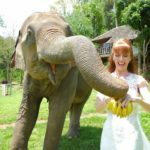 If you would like to know more about travelling in Thailand, where to stay, what to see, the language, culture and lots more, you can head on over to my travel blog Luxe Life Travel. I was truly blessed to have the opportunity to spend a day with Sazzu Hope. This woman is not only an incredible business mentor and podcaster, she is actually living the dream life of traveling the world while earning a living plus, she also has a passion for photography. We soon discovered that we shared a lot of the same points of view on animals, travel and life in general and she turned out to be the most perfect person to a) take the photos because she really understood what I was trying to achieve and b) to hang out with for a day. It may surprise some people to know that I actually dislike (immensely) having my photograph taken. But this brilliant woman made me feel so comfortable I can honestly say that by the end of the day I was even having fun being photographed. Seriously? Yep!